You are currently browsing the SafeSourcing Blog blog archives for August, 2010. Mr. President if you want to create some more jobs, hire some more FDA inspectors. This author offered the following post during September of 2008.? The Food and Drug Administration fills 1300 positions. Are consumers safer?? If we were to answer that question today based on the most recent egg recall the answer would be obviously not. So, I?m reading the Arizona Republic this past Saturday the 28th of August and come across the following article by Mary Clare Jalonick of the Associated Press. FDA to look at egg farms. The sub title was Official: Recall spurring action. You have to be kidding me. The article goes on to say that the Obama administration official says that inspectors will visit 600 large egg farms responsible for production of up to 80% of the nation?s eggs. This should be accomplished by the end of next year. Yes we mean the end of 2012. Snicker ;-(. Well I guess we are safer now. The question this all begs is what won?t we be looking at while we are so focused on eggs. If we were really concerned, why would we not hire a bunch of new inspectors between now and the end of September of this year and train the during October of this year and then finish the project by the end of this year.. This author bets that you could find enough qualified job seekers to fill and carry out this task. I mean they are going to be following a check list relative to things like refrigeration, sanitation and standard practices. This is not brain surgery. Hindsight is supposed to always be 20/20. If we visit wiki answers, the statement is defined as meaning that you can look in the past (hindsight) and see what you did wrong. Perfect vision is 20/20. So as you look back, you’re able to see “perfectly” what you should have done. So why does our government keep getting it wrong. How do you recall an egg or any product for that matter? To this author it does not really matter. What does matter is that you have to be able to trace where the egg came from, what you fed your hens or fertilized your crops with and how the consumable was processed. ?There has been any number of efforts in food industry traceability during the last decade that has resulted in a number of silly naming conventions. You may have heard of a few of them. I guess this means because we have a naming convention that progress is being made. 1.?From the farm to the table. 2.?From the farm to the fork. 3.?From the field to the fork. In light of the most recent egg recall what on gods green earth is the government doing about building a sustainable and traceable food system. We have this conversation to often and not much happens until the next occurrence. Product traceability that works would improve the efficiency and speed of response time following a food safety event like our most recent salmonella case. It would also contribute in a significant way to the protection of our public health and help consumer confidence following such an incident. Historically field investigators have been slowed by having to sort through paper reports and documents at numerous locations that are responsible for handing, packing and distributing these products. Make sure that your procurement solutions provider has a good response relative to how they can help you support traceability in your procurement process. A blog we repost quite often.” Twenty Five-steps to running high quality e-procurement events”. This author has republished this post in a variety of formats at least 8-10 times as the question never seems to go away when I meet with retailers and other companies interested in successful e-procurement implementation. 1. Executive sponsorship is mandatory. 2. This is required at the CEO and CFO level. 3. Get the entire buying organization together for a kickoff session. 4. Provide an over view of what you are going to do and the impact it can have on the company. 5. Use company financial models to reinforce result opportunities. 6. Discuss and agree on success criteria in advance. 7. Understand that every event will not be a homerun. 8. Singles and doubles score runs. 10. Consider prizes for the most creative use of auctions. 11. Use scorecards by department with percent of savings. 12. Discuss the meaning and importance of corporate aggregation. 13. Hand out event templates to gather existing product specifications. 14. Put a time requirement on data collection. 15. Don’t overlook any department, product or service. 16. Gather an accurate list of your present suppliers. 17. Work with your sourcing company to identify a top 100 list of events. 18. Calendar the events based on contract status. 19. Prioritize by dollar value, date and strategic value. 20. Conduct department level discovery meetings of 30 minutes to an hour. 21. Investigate existing contract language. 22. Look for auto renewal (evergreen) language roadblocks. 23. Determine alternate sources of supply with your sourcing company. 24. Develop an event rules and instruction template and post with each event. 25. Develop a clear terms and conditions template. Sourcing prescription drugs gets easier all of the time. This was the case years ago, but with the advent of many of the internet based prescription drug sites such as RXlist, Drugs.com and many retailers sites, it is easy to find lists, formulations, directions, dictionaries and generic equivalents. What more could a Pharma buyer ask for. Now all you need to do is use your e-procurement solutions provider to drive your costs down. According to RXlist, the top twenty prescription drugs in the U.S. are as follows. It’s never been easier to drive down your costs. WELLINGTON, New Zealand. According to the Associated Press A crate of Scotch whisky that was trapped in Antarctic ice for a century was finally opened today. But the heritage dram won’t be tasted by whisky lovers because it’s being preserved for its historical significance. 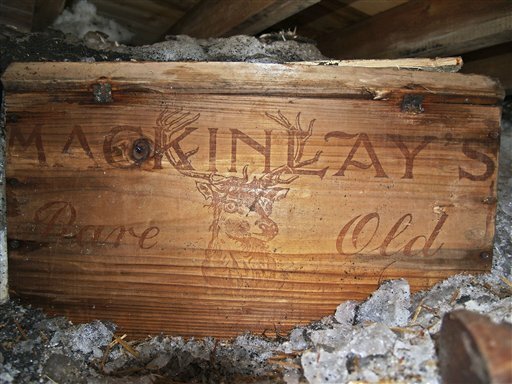 The crate, recovered from the Antarctic hut of renowned explorer Sir Ernest Shackleton after it was found there in 2006, has been thawed very slowly in recent weeks at the Canterbury Museum in Christchurch on New Zealand’s South Island. Your comments might be even better if we could enjoy some of this together. This author has had 50 year old Scotch, but never anything this old. Retailers are you aware of EcoLogo? Twenty year old EcoLogo was founded in 1988 by the Government of Canada but now recognized world-wide, EcoLogo is North America’s largest, most respected environmental standard and certification mark. EcoLogo provides customers – public, corporate and consumer – with assurance that the products and services bearing the logo meet stringent standards of environmental leadership. EcoLogo certifies environmental leaders in over 120 product and service categories, helping customers find and trust the world’s most sustainable products. This is part III of Tuesday’s post neither a leader nor a follower be. I hope everyone caught the fact that this was done between 1998 and 2003 and we are still discussing this problem six years later. The fact is that some of the same companies we are speaking of also sell products in Japan.